Summary: Extract from the Long Distance Walkers Association website "The extended Baker Way links Delamere Forest Park and Chester. The core of the route is provided by the original Baker Way - a long established route from Christleton to Brines Brow Picnic Area. 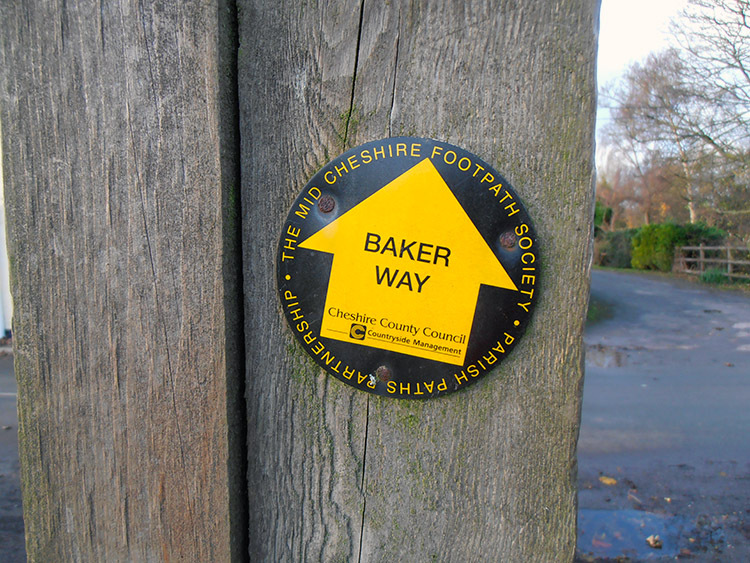 The original route was devised by members of the Mid Cheshire Footpaths Society and commemorates the life and work of Jack Baker, one-time footpaths officer for Cheshire County Council. The extended Baker Way provides links to bus and train services at both ends, allowing the route to be walked in either direction without the use of a car" Adam Gallimore walked the route in late 2011 and in doing so has provided an excellent amusing report of his walk in the company of Jacq. It is a must read and should stimulate anyone who is in the vicinity to do the walk for themselves. The Walk: Hey there guys "Top o' the mornin to ya". Before I make a start with my story I would just like to say thank you to Mike for giving me the opportunity to share it with you and I hope that you enjoy the read. I would also like to apologise for any bad grammar or spelling mistakes, but hey its not a book on fly fishing and I am defiantly no J.R. Hartley. Right then, lets get this show on the road. I live in the fair shire of St Helens, a sleepy little town well known for its glass industry, Rugby League and Johnny Wellies our very own lovable down and out. For quite some time now I haven't taken advantage of the wonderful countryside on offer only a stones throw away, instead preferring the drive of a few hours to either Snowdonia or the Lake District so in an attempt to rectify this I engaged the services of the inter web to find a suitable walk. To be honest I can't remember how I came across the Baker Way but I was proper cheddered that I did. 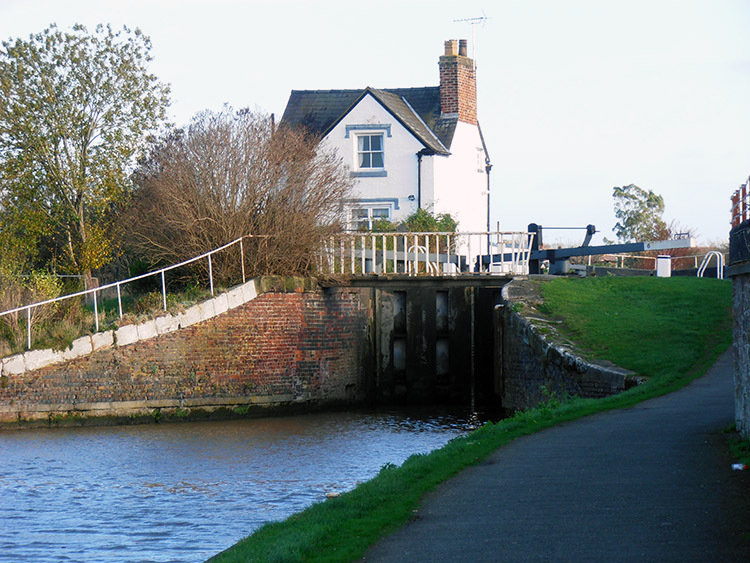 The traditional route for this walk starts at Chester railway station, following canal paths, tracks, trails and roads finally culminating at Delamere railway station some 13 miles later where many people decide to hop on the train back to Chester and the start. I did not need any arm twisting; I was sold and after a little read up about the route I decided that I would have a crack at it for myself the following Sunday. As usual all kit was sorted out the night before and with the 2 Geoffrey's (my trusty Salomons) where placed next to the front door ready for the off. The alarm clock signalled 5.30am and another early start, However, I did not need it to wake me as my 2 cats Freyja and Kyra had already done that an hour earlier when they kindly jumped all over me during their morning tag ritual. Down the stairs I wandered; a quick wash, some warm porridge and that was me ready to hit the road. Grabbing my kit I said good bye to the girls, loaded up the car and by 6am was on my way. Deciding to do the walk in reverse we arrived in Delamere Forest at 7.15am after a slight detour via Knutsford to pick up Jacq en route. Right, don't laugh. 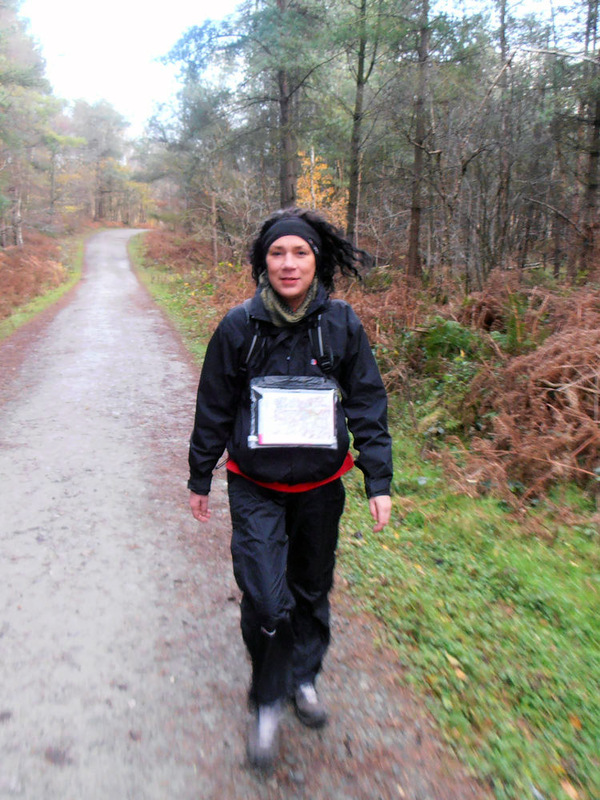 What is a walkers most essential item of kit? And what had I not brought? Yes you guessed it. My boots; I'd only gone and left the 2 Geoffreys at home hadn't I? So after a quick early morning melt down which saw the use of a few words not published in the all new Oxford Dictionary It was a round robin back to St Helens to pick them up. Not the best of starts, but an hour later with a feeling of deja vu we once again rolled into Delamere. My tip would be not to park on the large car park at the station; Instead drive down Station Road (B5152), with the station on your right hand side continue past for a few hundred metres until on your right you reach Frith Avenue. Up to now there are no parking restrictions here so you are free to stop as long as you want and it wont cost you a brass razzoo . Some of you might think I sound like a bit of a tight wad, I prefer the expression Mr Thrifty personally. Honestly though this is a top tip as the station car park, depending on the time of year has opening and closing times. So unless you have brought a sleeping bag with you be prepared for an uncomfortable cold nights sleep in your car if the gates are locked when you get back after your walk. First impressions as we got out of the car were that as it was now 8.20am and light we would be finishing our walk in the dark. Well I suppose on the plus side this would give me chance to try out my new flashlight; a stunning piece of engineering wonderousment which I will regale you with later. Heading down Frith Avenue we turned left on reaching Station Road (B5152) and continued along the road for approximately 500 yards reaching Delamere Station car park. The weather forecast was noted to be overcast with strong winds later and as we walked through the car park two Caterham Seven sports cars pulled in. I couldn't help but chuckle to myself as I had a vision in my head of these two guys in their cars driving along with umbrellas up to stop themselves getting wet. Having said that they were stunning cars. 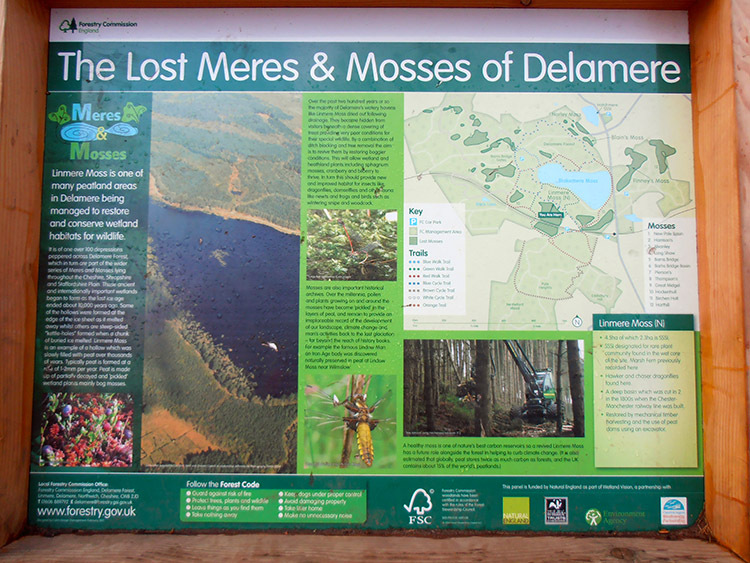 In the past I have been to Delamere many times as a child with my mum, dad and sister and walked around the forest. We used to go conkering and collecting chestnuts; many happy memories indeed. Even in later years I remember we would call in at the station café or the ice cream parlour that sold Snugburys ice cream. Unfortunately both were shut as we walked past. Through the car park we walked continuing through a short stretch of woodland until we reached a bridge where we turned right over the railway leading in to the forest. In recent years Delamere has had extensive redevelopment work carried out which still continues now. Families come here to walk and cycle along the many forest tracks, to learn about wildlife and even enjoy the experience of Go Ape, an outdoor activity centre where you can take on zip wires, Tarzan swings and more. It has also always been a place where you could be guaranteed to see plenty of squirrels and today was no exception as they ran across the path and jumped from tree to tree as we passed. Continuing along the forest track known as Battleaxe Road we walked for 1.5 miles before we emerged on to Ashton Road. Turning left we walked the half mile down Ashton Road to the crossroads at the intersection with Dark Ark Lane. Road walking is not really my cup of tea as some of the drivers shall we say get a little close but hey ho this was the route. At the cross roads we headed left up Dark Ark Lane and after 200 yards a sign for the Baker Way would lead us though a short overgrown path. In hind sight it would have been just as quick to stay on the road and take the next right as they both led on to Grange Road. After 100 yards we took the left hand fork in the road and followed the lane for just short of 1 mile to Ashton Hayes at the junction of Church Road. At the Junction we decided to have a sit down on a bench while Jacq adjusted her boots as they where beginning to rub. I asked her to let me know if it got any worse and we would turn back as walking miles and miles with a sore foot is no fun. All turned out well though as the adjustments she made did the trick and there were no more boot issues. Turning left at the junction we continued along Church Road to Ashton Hayes Church. Things got a little tricky here as the route was not clear at all. Firstly we walked around the side of the church but that did not lead anywhere, then back to the car park and that too led nowhere either. Bit of a head scratcher this one I thought so I checked the map and said to Jacq that we should walk around the rear of the church to see if we could see the path. Walking though the grave yard we said hello to the Vicar as we passed him dressed in his work clothes, then we noticed a stile and way marker to our left. Over the stile and down to the bottom of the field we went following the hedge row round and on to Gongar Lane. Crossing Gongar Lane we entered Peel Hall Farm. Wow, how cool is that? A motorised gate! I have never seen one of these before. As we approached, it opened automatically. I think its one of the most amazing things I have ever seen. Another look at the map would indicate that the route was diagonally through the field. 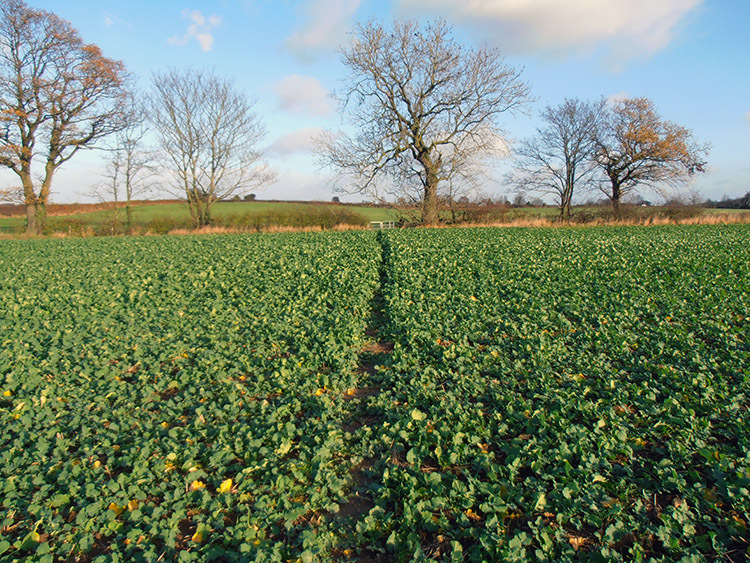 However, with no footprints and modernisation work taking place at the farm I thought it more courteous to follow the track to the hedge row at the bend in the track then follow the hedge to the top of the field, hopefully picking the route back up. As we walked along the hedgerow a young lady on horseback asked us if we where OK. "Yes" I responded and asked if it was OK for us to follow the route we were, rather than to traipse across the middle of the field. She replied by saying that it was and if we wanted we could have carried on up the track and around the farm. Things now started to get a strange. As I said the farm was being modernised so as well as building work, new fences had been erected also. We could see the road we needed to be on only 50 yards away down a path with what seemed to be a gate leading to it. Down the path we walked admiring the two horses in the field and noticing that the fences were electrified. I always take notice of electrified fences after an incident on the Bullock Smithy a few months previous and find it best not to touch theses fences now. Well I can't actually believe what I saw next. Mr Farmer had only wired the fence up to the latch mechanism of the gate. Charming, no warning signs or anything. So we backtracked down the path, looked around and eventually saw a little yellow marker arrow a few yards further on. Back on the road we walked for 300 yards and at the bend in the road turned right and followed a path along a stream for 400 yards before turning left over a bridge into another field. Thinking it wise to check the map again before walking off in the wrong direction we stopped at the bridge where a rather talkative chappie out with his dog stopped to pass the time. Why is it every time I get my map out some one comes along and the first question is................ "Are you lost?" I am currently trying to think of some witty remark that does not use expletives as a response but up to now can only think of a phrase that starts in F and ends in off. To give him his due though he was nice enough and said that he had done the Baker Way many times and would usually get his wife to drop him off in Chester and he would walk back. "Are you getting the train back to Delamere?" he asked. When I told him we where walking to Chester then back to Delamere he thought we were mad but wished us well all the same. So across the field we walked and then down a track for 100 yards to a stile on the right leading through a field of crops. I would defiantly say that during the summer this would be confusing but we heard talkative chappie from earlier shout "Yes, thats right, straight through the field" Through three more fields we walked for 0.5 miles dodging the fresh cow pats. Hey another thing I have noticed on my many walks. Cow pats on the path? I mean come on, its a big field, so why do it where we are walking? What's wrong with going in the corner over there? These are questions that need answers, they are up there with the seven wonders of the world for me. I will probably wake up in the middle of the night searching for an answer. So if any of you guys can shed some light on it I would be eternally grateful. At the end of the fields we emerged on to Barrow Lane and crossed over for the short walk along Sandy Lane to where it met Kelsall Road (A54). Crossing the busy A54 we headed east for 100 yards before turning left up the High Street in to Tarvin. After 400 yards we passed the George and Dragon pub on our right hand side. However, due to our later than planed start we would have to pass up the chance of a cheeky pint or two in favour of a packet of Eccles cakes and a carton of Ribena from the post office opposite. They were much appreciated and they did not last long either. After our pit stop we continued along the High Street for 200 yards until we came to the entrance of Hockenhull Lane on our left. The correct route is to walk down Hockenhull road for 600 yards, bearing left at the woodland walk sign. However, with a combination of too much talking, not paying attention and the sign post hiding in the bushes we wandered straight past it, carrying on to the next foot path sign and out on to the A54 in completely the opposite direction. As soon as we emerged on to the A54 I realised we had taken a wrong turn especially when I noticed that some one had moved the roundabout. It was on our left and should have been on our right. Hmmmm, and to make matters worse Jacq pointed out that the bus which passed us was going to Chester again in the wrong direction. A quick consultation with the map and all became clear and we were once again on our way (in the right direction now). On reaching the roundabout I checked our time, just after noon. 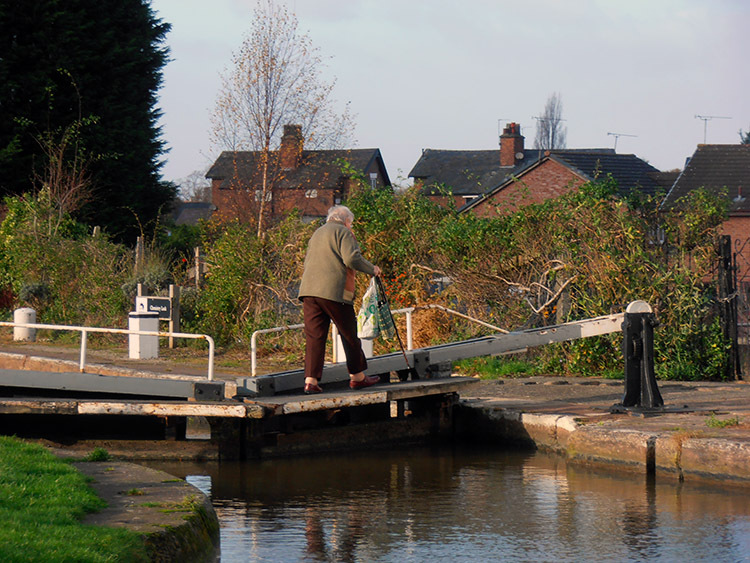 As Chester was only 5 miles away along the busy A51 I suggested that instead of retracing our steps we should instead follow the A51 and when we get close to the canal, rejoin the path and follow it to our destination. This way we would make up a lot of time and we could walk the part of the route we missed on the way back. Jacq agreed and off we went. The A51 is quite boring, well that is unless you like looking at cars, then I suppose its not, so I took the opportunity to explain a little about map reading to Jacq, pointing out places and landmarks on the map and showing her how to judge how long it will take to walk from one point to another. I think she was impressed, I was, and it kind of made up for my route faux pas earlier. 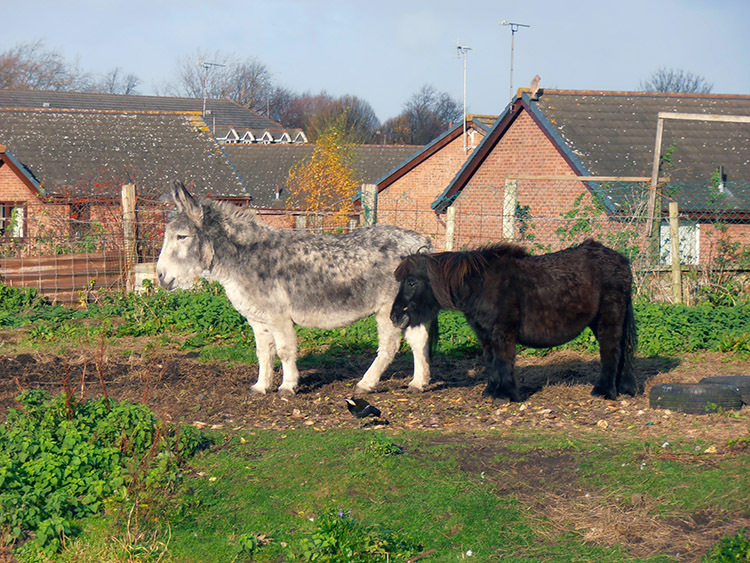 We followed the A51 for 2.75 miles until we reached Barnhouse Veterinary Surgery on the right where we then crossed the road to follow Littleton Road. After 180 yards Littleton Road branches off to the left; We took the road to the right (The Bypass) for a further 230 yards before turning right on to Pearl Lane, over a bridge spanning the A55 and down to the junction where it meets the A41. At the junction we turned left walked 200 yards slightly up hill before turning left descending some steps and turning left once more on to the footpath of the Shropshire Union Canal. 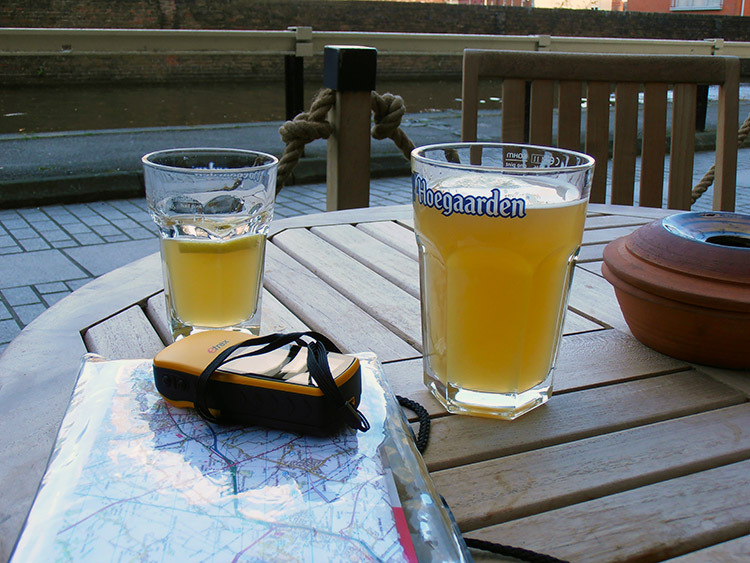 Hoegaarden "Thank you, Lord Jesus"
Our destination was in sight and another 1.25 miles would see us finally in Chester. A straight forward route now following the canal. As we walked we passed others out for a Sunday stroll and even a few weekend captains sailing their barges between the many locks trying to get the last of the good weather before Jack Frost set in. Cyclists passed us and I must say that there etiquette was much better than those on the Monsal Trail. A quick tinkle on the bell and an "Excuse me, cyclist coming through" always gets a better response from me rather than trying to run you over whilst shouting " Get out of my way" We noticed Mr and Mrs Mallard with their many relations out for a swim and an elderly woman clamber across the lock gates from one side of the canal to the other with some goodies for a group of donkeys. I couldn't help but wonder why she did not use the path an if she had ever fell in. 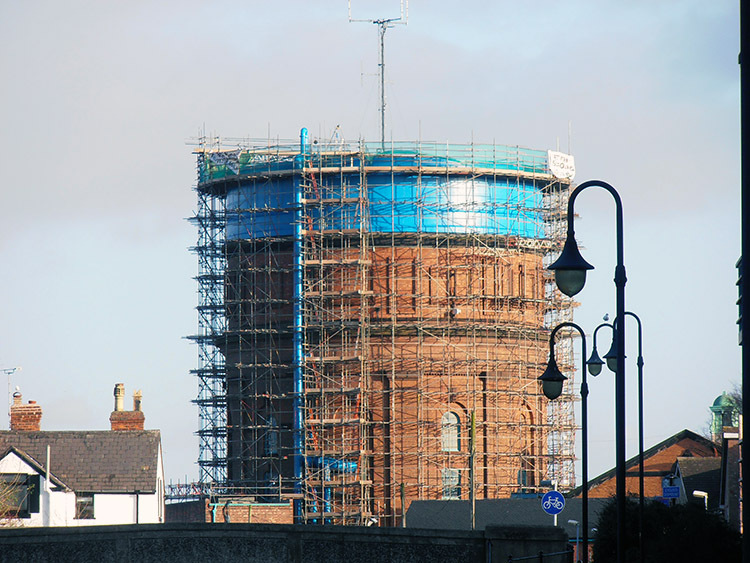 One of the last sights we saw was the circular water tower; It looked amazing. However, I have to admit I had to wait till I got home and Googled it before I knew what it was. Eventually we arrived at The Old Harkers Arms, just in front of bridge 123. 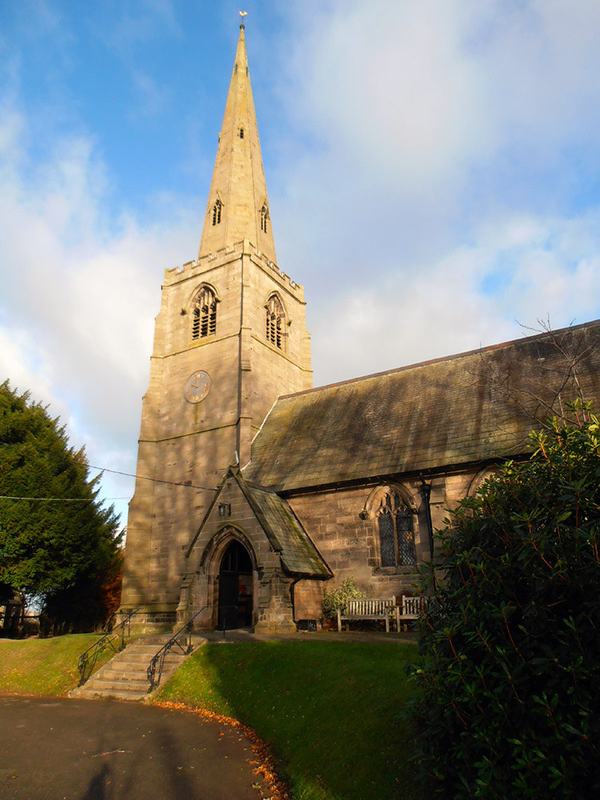 For some walkers the short stroll over the bride, along City Road to the station would mark the end of their journey as they board the train back to Delamere. Not me and Jacq though, we were on a limited budget as we had spent all our pocket money; Well perhaps not all of it and as I scrabbled about in my trouser pocket managing to cobble together enough coinage for a pint and a half of Hoegaarden. I'll tell ya, the good Lord Jesus must have been shinning down on me that day cause Hoegaarden is my favoritest beverage and even though it was chilly we still decided to sit out side with our drinks and do a spot of people watching before heading off on the return leg of our walk. 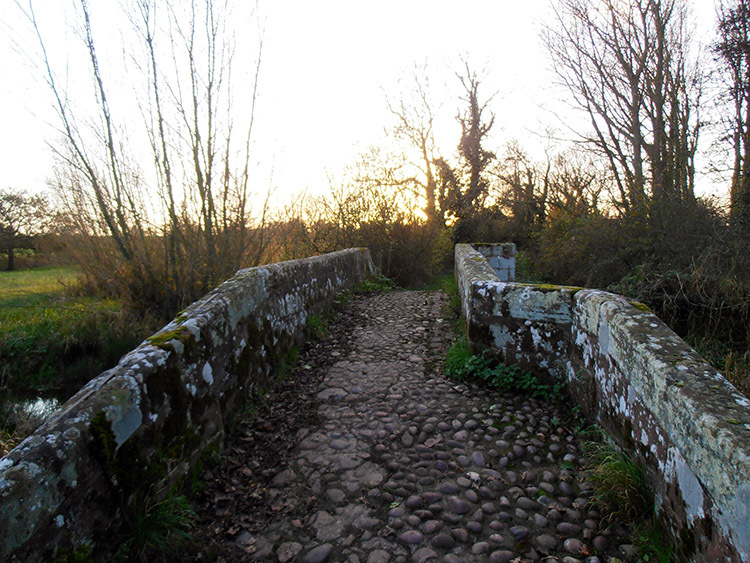 As we walked back along the canal path for 2.5 miles, under the bridge where we had first joined it a few hours earlier to Rowton Bridge Road the sun was still high in the sky making our day out even better than first hoped as we were expecting strong winds and rain. Our route now was the one that we should have followed earlier before we decided on the detour to gain some time and would need a bit of map work so as not to get lost but luckily it was well way marked which was a bonus. Turning left at the top of the steps we walked over Rowton Bridge and along the road for 70 yards taking the first road on the right (Skipps Lane). At the end of Skipps Lane we followed a path down the side of a house to a field with a path leading down to the canal path which we continued along for another 400 yards before bearing left through a further two fields exiting on to Brown Heath Road. Crossing the road we headed down a track, round the back of a house with a small lake on our left into another field with a cluster of trees in the middle of it, through a hedge turning immediately right at the next group of trees surrounding another small lake to a gap in the hedge row. Following the hedge line for 350 yards we came to a track where we turned left and followed it to where it met Plough Lane. Turning right on to Plough Lane we walked for 400 yards and ignoring the road bending to the left continued straight on for 0.5miles along Platts Lane to a path though a wooded area. 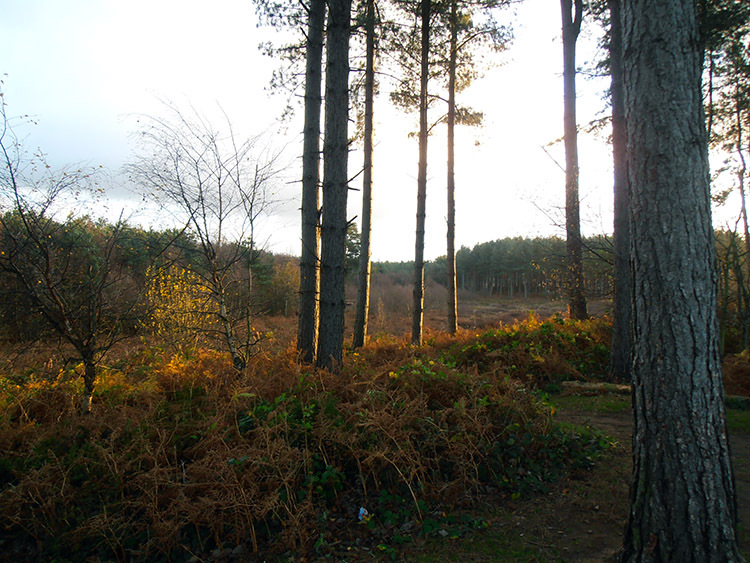 By now the sun was starting to set and we hoped that we would at least get to Delamere forest before dark. However, we still had a fair old trek to get there. Along the path and through the wooded area we continued for 800 yards not taking a great deal of notice of the scenery by now, just trying to walk as fast as we could. On reaching the junction in the path we headed left past Hockenhull Hall Farm, over the busy A51 and out on to Hockenhull Lane, this time spying the sign post hiding in the bushes. We were now back on familiar ground and turning right at the end of Hokenhull Lane we once again entered the High Street at Tarvin. The smell of the Sunday roast at The George and Dragon was very tempting but we opted for a packet of nik naks and a bottle of Pepsi instead, after all I don't think they would have done a take away version of the Sunday roast that we could have ate while we walked. At the end of High Street we decided that we should turn right and follow the busy A54 rather then cut though the fields. The two Geoffreys had been good boys today and I couldn't reward them by dunking them in a fresh cow pat. If I did that they might never come out with me again. Along the A54 we walked for 0.75 miles then turning left along Ashton Lane for another mile before reaching Ashton Hayes Church. The light now was almost gone and as we reached Grange Road for the second time it was time to get out my new toy. I bet this is the part you have all been waiting for ain't it? My new flash light, words cant describe how brilliant it is. Its a LED Lenser P7 (other generic light sources are available) and with 200 lumens of focusable light and 130 hours of battery life its like having your own pocket lighthouse. This baby will light up the way ahead like Bonfire night. We did not need its full power for Grange Road as its rather quiet so we continued with it on minimum setting. On reaching the top of Grange road we turned left, scaring the nesting birds as we did and walked down to the junction of Dark Ark Lane and Delamere Lane. Turning right up Delamere Lane it was finally time to unleash the true power of the beast in my palm. Even though it was now around 5pm Delamere Lane was rather busy and some of these drivers where whizzing by far to fast and far close for my comfort. Does anyone remember the phrase "Dip don't dazzle"? Well that's all fine and dandy when your in a car but when I am out walking and there are nutters on the road I prefer to dazzle than dip; make sure the swines see you so they don't run you over that's my advice (ohhh, best put a disclaimer in here so I don't get sued. I do not encourage the act of blinding drivers with with flash lights). Almost finished guys. So on we walked to where we had earlier exited Delamere Forest and retraced our steps back to the car. There is not very much else to comment on as by now it was pitch black but as we walked though the car park we noticed that the gates had been locked and the café and ice cream parlour where still shut. Everything was the same as it was when we had earlier set of on our walk. Well perhaps not everything as both mine and Jacq's legs were feeling very tired. Thanks for following us. Goodbye.